It was only when G and I came to Australia that we started eating a lot of Thai food. That's probably because half of the restaurants in Sydney (okay, maybe I exaggerated a little...slightly less than half perhaps) serve Thai cuisine. 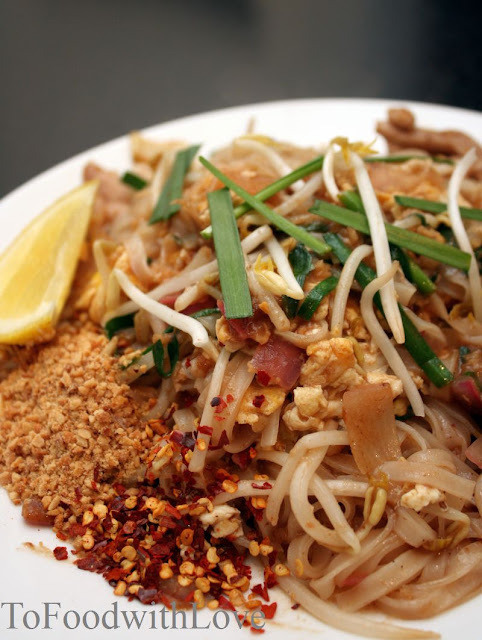 I usually order a Pad Kee Mao and G will, without fail, order his favourite Pad Thai. So, while we were out on our grocery run this morning, G asked if I wanted to make Pad Thai for dinner. We had recently watched an episode of Poh's Kitchen on TV this week and there was a segment on preparing this dish. So we decided to try it out and bought all the necessary ingredients. The way it was prepared on TV looked quick and easy. Of course, it would have been better if we had a cast iron wok over a flaming hot stove, but our Tefal non-stick wok did the job just fine. We didn't have prawns (as used in the recipe), so we added chicken instead. The pad thai turned out fantastic, almost as good as the one we had at Thai La-Ong in Newtown some time back. It was moist and had the right balance of sweet, salty and sour. Great texture in the noodles too, and I simply loved the sweetness of the red (spanish) onions in it. No more takeaway pad thai for us! Or perhaps not for me at least. Serve on a plate with two teaspoons of crushed roasted peanuts and crushed red chilli flakes on the side. Garnish with bean sprouts, chives and a wedge of lime and serve immediately.